GENEVA, Sep 21 2017 (IPS) - The pursuit of international peace and security has been on the agenda of international decision-makers ever since the establishment of the League of Nations on 10 January 1920. There has been a constant ambiguity about the way this commitment has been translated to practice. The Covenant of the League of Nations committed itself “to promote international co-operation and to achieve international peace and security”: nevertheless, the eruption of violence and geopolitical confrontations lead to another major confrontation two decades later. This reinforced the determination of the world community to redouble its efforts to promote peace and security. The Chairman of the Geneva Centre for Human Rights Advancement and Global Dialogue said that the UN Charter – adopted on 26 June 1945 – did not prevent the atomic bombings of Hiroshima and of Nagasaki less than two months later. The disastrous consequences of the Second World War was a terrible reminder of humanity’s ability to bring the world close to apocalypse. Partly for such reasons more than 60 million people continue to be forcibly displaced today and peace continues to be so elusive. This year’s annual theme for the 2017 International Day of Peace “Together for Peace: Respect, Safety and Dignity for All” draws the attention of the need of the world community to unite its forces in support of people up-rooted and separated from their kith and kin. 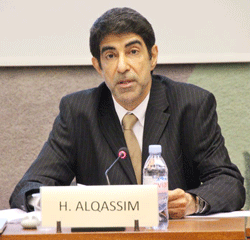 Dr. Al Qassim noted that the refugee and migrant crisis have become the symbol of the world’s inability to live up to the ideals of the Founders of the UN to promote peace and justice worldwide. Foreign invasions exacerbating resort to terrorist violence keep peace in jeopardy. So does the simultaneous rise of right-wing populist parties in the West which has become the driving force of xenophobia, bigotry, racism and marginalization of the Other. The combination of these elements once the symbol of a world undermining the peace that its peoples yearn for. The Chairman has also concluded that the Arab region has been adversely affected by the rise of violent extremism and the proliferation of local and international conflicts. The civil wars and/or internal upheavals in Syria, Yemen, Libya, Sudan and Iraq have resulted in the forced displacement of millions of people. In total, more than 13 million people have been forced to leave their home societies owing to the lack of security and the surge of violence. Millions of people have embarked on perilous and hazardous journeys over the unpredictable Balkan route. As the latter is being sealed off, they engage on the perilous crossing of the Mediterranean Sea from North Africa. Walls and fences have been built – and even detention camps – to respond to the unprecedented rise of people on the move. These liberal societies which cursed the Berlin Wall cordoning off the free flow of ideas now advocate new walls to cordon off the free flow of people in distress. He asked: How come that Europe cannot accommodate displaced people counting for less than 1% of Europe’s total population when certain countries in the Middle East provide protection to refugees and migrants accounting for more than 20% of their own populations? Making matters worse, Islamophobia is also on the rise in Southeast Asia where the ominous policy of ethnic cleansing has reared its head once again. Guided by the vision of promoting peaceful societies and addressing the plight of people on the move, the Geneva Centre will be organizing a panel debate on 15 December 2017 entitled “Migration and human solidarity, a challenge and an opportunity for Europe and the MENA region.” He hoped that the debate will further promote a joint response of stakeholders from the Global North and the Global South responding with one voice to the injustice that is targeting people on the move in the Arab region and in other regions of the world. He called upon decision-makers should remain guided by the principles of international solidarity and justice in addressing the plight of refugees and migrants. We can no longer remain indifferent to a crisis that has become the symbol of the world’s inability to promote peace and justice.